For those of you who don’t know – Andrew Collinge is one of the leading hair dressing salons here in the UK. The new range was formed from a collaboration between clients and stylists, drawing from years of experience. After visiting the salons for a number of years I was eager to try out their new products and they didn’t fail to impress me. I got the chance to talk to Andrew Collinge and his wife Liz about their new range of products (CO by Andrew Collinge) and of course I wanted to quiz them on all things to do with my hair whilst I was there! WHAT’S YOUR FAVOURITE PRODUCT FROM THE NEW RANGE AND WHY? Liz – For personal use I love the Argan Oil. We worked on this product for a long time to achieve a ‘feel’, which is silky and smooth but not oily. It also cuts down blow drying time – a must when you have thick hair. 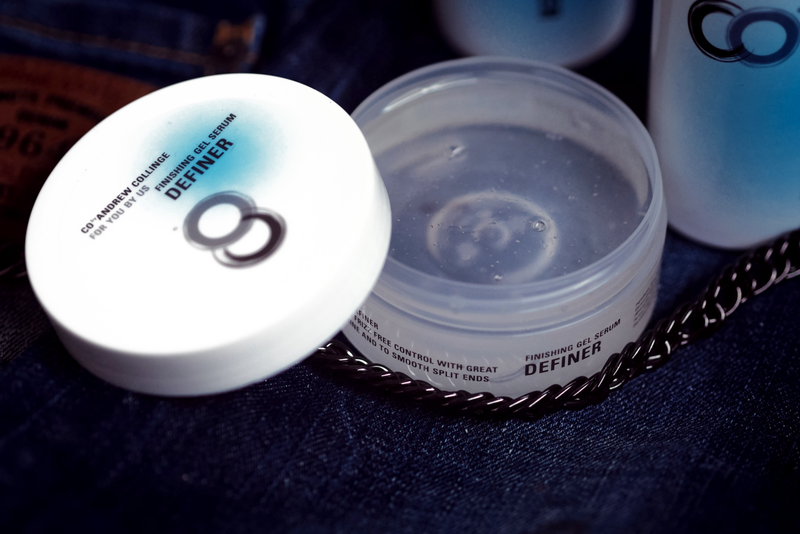 Andrew – I love working with Definer, which is a perfect finishing product for short or long hair. 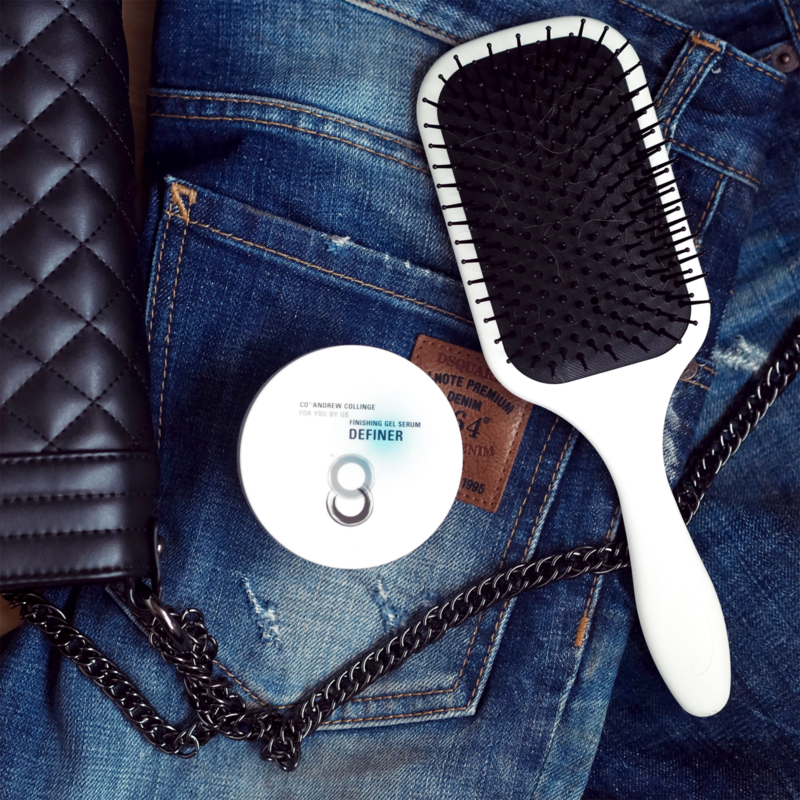 It can control frizz, define curl, create texture and add fantastic shine. DO YOU HAVE ANY SECRET TIPS FOR FLAT, THIN HAIR? Less is more for this type of hair. A good cut is essential with short or long layers. After washing I would use Co by Andrew Collinge Blow Dry Lotion. 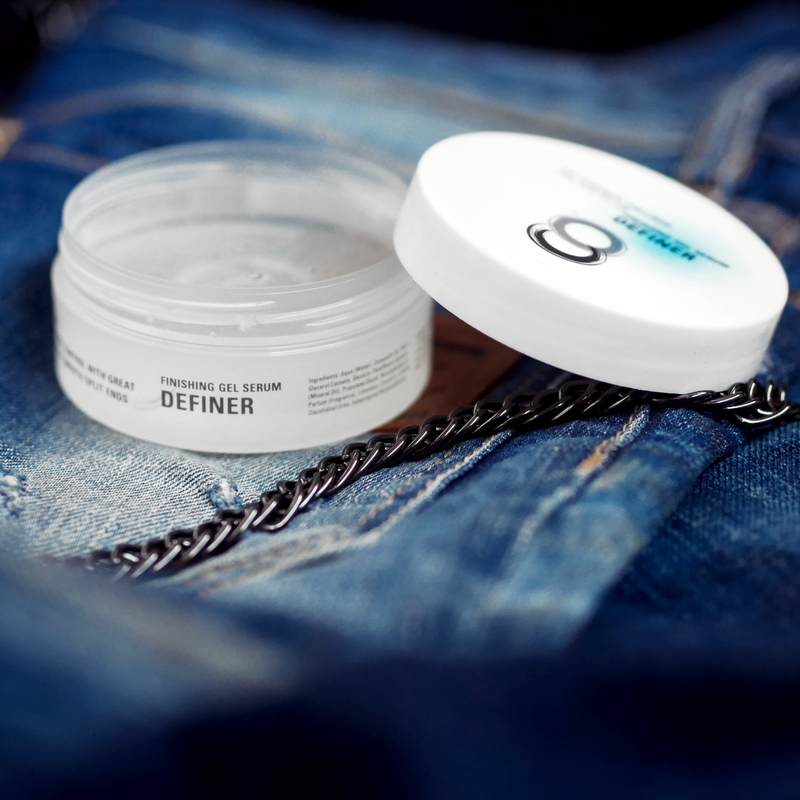 This is a lightweight styling product, which will allow you to create volume without weighing down the hair. It is important to get root lift so always dry the roots using a vent brush to direct the hair away from the scalp. Then blow dry as usual finishing with Co by Andrew Collinge Firm Hold hair Spray. I PUT MY HAIR THROUGH A LOT, I’M CONSTANTLY TRYING OUT NEW STYLES! ARE THEN ANY WAYS TO KEEPS HAIR HEALTHY EVEN WHEN CONTINUOUSLY STYLING IT WITH HEAT APPLIANCES IN PARTICULAR? There are two things to look out for – moisture and heat defence. 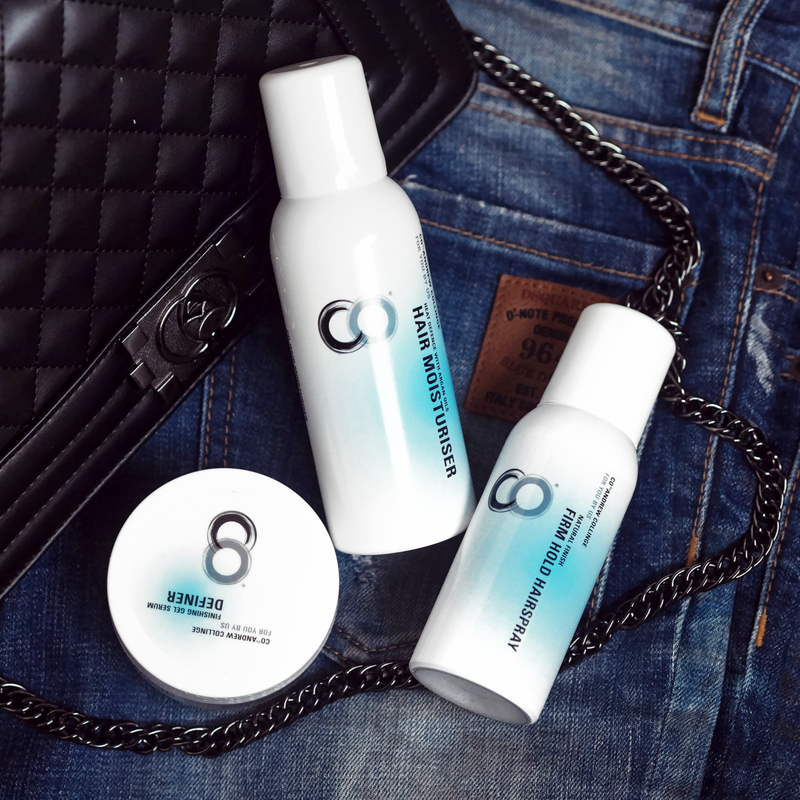 Make sure you choose products to boost moisture when shampooing and conditioning and also styling products which are specifically formulated for protecting against heat appliances such as straighteners and also frequent blow drying. You are in luck! 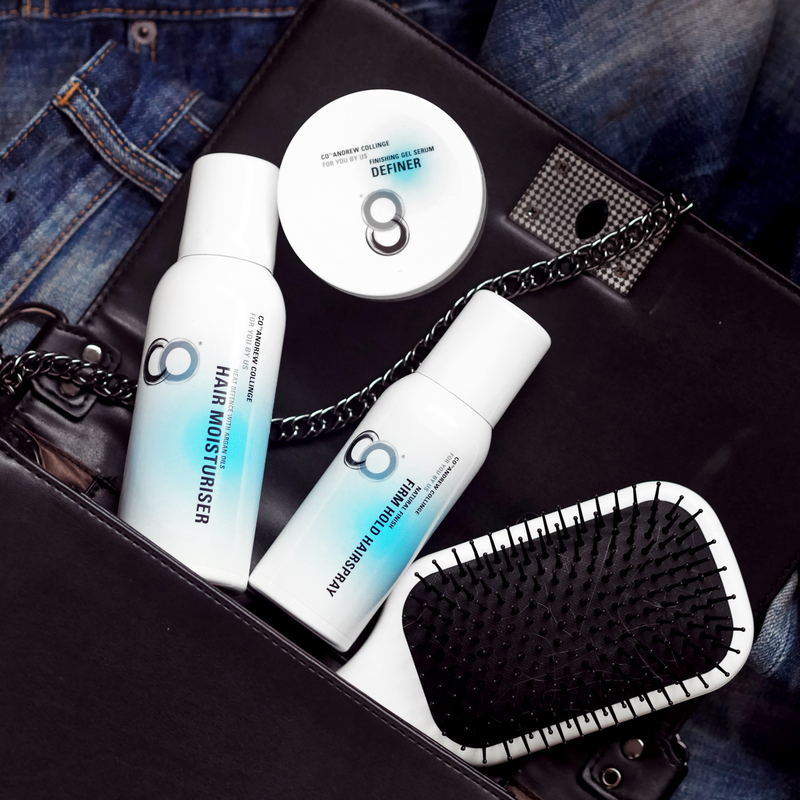 The Co by Andrew Collinge Hair moisturiser will do both. Use it as a leave- in conditioner before blow drying. It also has heat defence ingredients. If your hair feels dry between hair- drying sessions you can also spritz a little hair moisturiser onto the ends. DO YOU HAVE ANY ADVICE FOR GROWING YOUR HAIR LONG, IE, WHAT IS THE IDEAL TIME PERIOD TO GET IT TRIMMED ETC? A regular 6 weekly trim works for most people but particularly if you see the ends splitting. This doesn’t make it grow quicker but ensures that your hair is in good health; therefore it won’t be prone to splitting and snapping which will get you to your goal sooner. You should also keep your hair well moisturised and treat it with TLC. HOW MANY TIMES SHOULD YOU WASH YOUR HAIR A WEEK? This is personal of course. We recommend every 2- 4 days depending on hair type and oiliness. If you over-wash hair it can stimulate the production of oil so it starts a vicious cycle. I HAVE A SIGNATURE ‘DO’ AND IT’S BIG CURLY WAVES, WHAT PRODUCTS FROM YOUR NEW RANGE SHOULD I USE TO CREATE THIS STYLE? The Mousse is ideal for creating ‘Big’ hair. After shampooing and conditioning, remove excess water from the hair and apply mousse throughout working from the roots to the tips. Dry in the usual way. Hairspray is important too. When finished for extra volume, tip your head upside down and spray Co by Andrew Collinge Firm Hold hair Spray. Throw your hair back and allow to fall in place. IS THERE A WAY TO CREATE VOLUME WITHOUT BACKCOMBING YOUR HAIR? This could be a very long answer but will try to be brief! If blow drying the answer is to achieve root lift and use the right products such as mousse and blow dry lotion – or even both together. Root lift is achieved by literally directing the hair away from the scalp at right- angles and blow drying to create the ‘lift’. If you are setting the hair with either rollers or barrel curls you should 90% dry the hair, spay on a little hair spray. Roll or pin in place and then dry. The best way to do this is with a diffuser attachment on your hairdryer. You also need to let the hair cool down completely before removing rollers/pins. After dressing out use hairspray as before – ie tip your head forward, spray and the tip your head back. WHERE DID THE INSPIRATION COME FROM FOR THE UNIQUE FRAGRANCE OF YOUR PRODUCTS? Spicy fragrances are a favourite of both of us. So it is quite self-indulgent! But we did a lot of research with both male and female clients and it has been a definite hit. LASTLY HOW CAN WE CREATE A SALON FINISH LOOK AT HOME WITH THESE PRODUCTS, OR WHAT IS YOUR FAVOURITE STYLE TO RECREATE AT HOME? This is an excellent question and to help achieve professional results at home we have made short , easy to follow films which you can view on our website. These demonstrate how to work with the products on various textures and hair types.